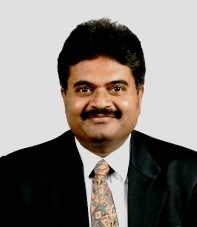 Dr.Anil - Marketing Musings: 21st article published in HANS INDIA today (1st November 2014) It is titled " Super Markets in USA - Marketing par excellence!" 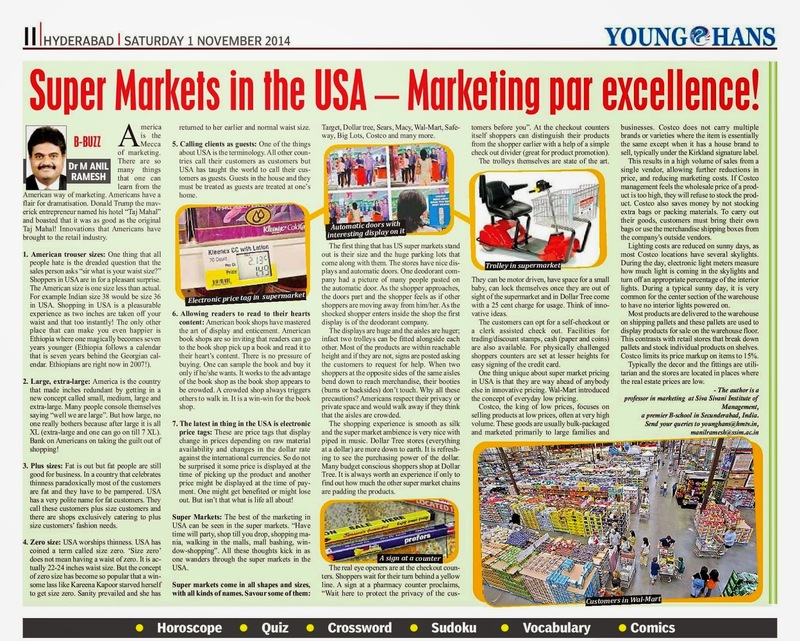 21st article published in HANS INDIA today (1st November 2014) It is titled " Super Markets in USA - Marketing par excellence!" 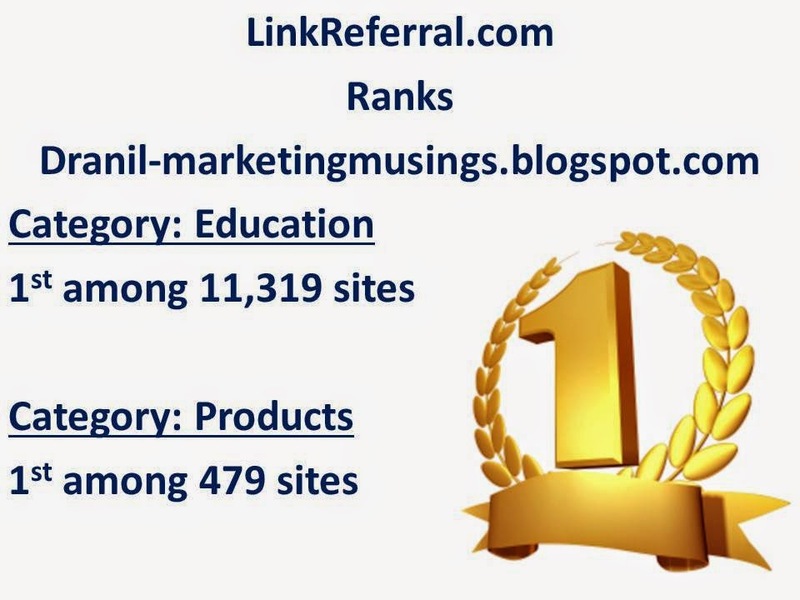 Super Markets IN USA – Marketing par excellence! America is the Mecca of marketing. There are so many things that one can learn from the American way of marketing. Americans have a flair for dramatization. Donald Trump the maverick Entrepreneur named his hotel “Taj Mahal” and boasted that it was as good as the original Taj Mahal! Innovations that Americans have brought to the retail industry. 1. American trouser sizes: One thing that all people hate is the dreaded question that the sales person asks “sir what is your waist size?” Shoppers in USA are in for a pleasant surprise. The American size is one size less than actual. For example Indian size 38 would be size 36 in USA. Shopping in USA is a pleasurable experience as 2 inches are taken of your waist that too instantly! The only other place that can make you even happier is Ethiopia where one magically becomes 7 years younger (Ethiopia follows a calendar that is 7 years behind the Georgian calendar. Ethiopians are right now in 2007!). 2. Large, extra-large: America is the country that made inches redundant by getting in a new concept called small, medium, Large and extra-large. Many people console themselves saying “well we are large”. But how large, no one really bothers because after large it is all XL (extra-large and one can go on till 7 XL). Bank on Americans on taking the guilt out of shopping! 3. Plus sizes: Fat is out but fat people are still good for business. In a country that celebrates thinness paradoxically most of the customers are fat and they have to be pampered. USA has a very polite name for fat customers. They call these customers plus size customers and there are shops catering to plus size customers’ fashion needs. 4. Zero size: USA worships thinness. USA has coined a term called zero size. Zero size does not mean having a waist of zero. It is 22- 24 inches at waist. But the concept of zero size becomes so popular that a winsome lass like Kareena Kapoor starved herself to get a zero size. Sanity prevailed and she has returned to her earlier and normal waist size. 5. Calling clients as guests: One of the things about USA is the terminology. All other countries call their customers as customers but USA has taught the world to call their customers as guests. Guests in the house and they must be treated as guests are treated at one’s home. 6. Allowing readers to read to their hearts content: American book shops have mastered the art of display and enticement. American book shops are so inviting that readers can go to the book shop pick up a book and read it to their heart’s content. There is no pressure of buying. One can sample the book and buy it only if one wants. It works to the advantage of the book shop as the book shop appears to be crowded. A crowded shop always triggers others to walk in. It is a win-win for the book shop. 7. The latest in thing USA is electronic price tags. These are price tags that display change in prices depending on raw material availability and changes in the dollar rate against the international currencies. So do not be surprised it some price is displayed at the time of picking up the product and another price might be displayed at the time of payment. One might get benefited or might lose out. But isn’t that what is life all about! Super Markets: The best of the marketing in USA can be seen in the super markets. “Have time will party, shop till you drop, shopping mania, walking in the malls, mall bashing, window-shopping”. All these thoughts kick in as one wanders through the super markets in the USA. Super markets come in all shapes all sizes and all names. Savor some of them: Target, Dollar tree, Sears, Macy, Wal-Mart, Safeway, Big Lots, Costco and many more. The first thing that sets apart the US super markets is their size and the huge parking lots that come along with them. The stores have nice displays and automatic doors. One deodorant company had a picture of many people pasted on the automatic door. As the shopper approaches, the doors part and the shopper feels as if other shoppers are moving away from him/her. As the shocked shopper enters inside the shop the first display is of the deodorant company. The displays are huge and the aisles are so huge that two trolleys can be fitted alongside each other. Most of the products are within reachable height and if they are not signs are posted asking the customers to request for help. When two shoppers at the opposite sides of the same aisles bend down to reach merchandise, their booties (bums or backsides) don’t touch. Why all these precautions? Americans respect their privacy or private space and would walk way if they think that the aisles are crowded. The shopping experience is smooth as silk and the super market ambience is very nice with piped in music. Dollar Tree stores (everything at a dollar) are more down to earth. It is refreshing to see the purchasing power of the dollar. Many budget conscious shoppers buy at Dollar Tree. It is always worth an experience if only to find out how much the other super market chains are padding the products. The real eye openers are at the checkout counters. Shoppers wait for their turn behind a yellow line. A sign at a pharmacy counter proclaims, “Wait here to protect the privacy of the customers before you”. At the checkout counters itself shoppers can distinguish their products from the shopper earlier with a help of a simple check out divider (great for product promotion). The trolleys themselves are state of the art. They can be motor driven, have space for a small baby, can lock themselves once they are out of sight of the supermarket and in Dollar Tree come with a 25 cent charge for usage. Think of innovative ideas. The customers can opt for a self-checkout or a clerk assisted check out. Facilities for trading/discount stamps, cash (paper and coins) are also available. For physically challenged shoppers counters are set at a lesser heights for easy signing of the credit card. One thing unique about super market pricing in USA is that they are way ahead of anybody else in innovative pricing. Wal-Mart introduced the concept of everyday low pricing. Costco the king of low prices focuses on selling products at low prices, often at very high volume. These goods are usually bulk-packaged and marketed primarily to large families and businesses. Costco does not carry multiple brands or varieties where the item is essentially the same except when it has a house brand to sell, typically under the Kirkland Signature label. This results in a high volume of sales from a single vendor, allowing further reductions in price, and reducing marketing costs. If Costco management feels the wholesale price of a product is too high, they will refuse to stock the product. Costco also saves money by not stocking extra bags or packing materials. To carry out their goods, customers must bring their own bags or use the merchandise shipping boxes from the company's outside vendors. Typically the decor and the fittings are utilitarian and the stores are located in places where the real estate prices are low.